Similar form factor to the Garmin Edge 500 and seems to do EVERYTHING the Garmin does for a LOT less money. dx.com has a great price for the GS-580P, $167. $216 from Amazon (Amazon's GlobalSat GB-580F has the same features/sensors as the one from dx.com) they both come with Speed, Cadence and Heart Rate monitor strap and free shipping. The Garmin Edge 500 with similar specs and sensors is $350 at Amazon.com. The model I've got, the 580P, comes with a a Speed sensor, a Cadence sensor and a Heart Rate sensor/strap. The Speed sensor is very useful when riding trainers or rollers indoors or when you don't need/want to use the GPS speed information. Actually the Speed sensor probably can provide greater accuracy than the GPS speed data as you don't rely on being able to get a good satellite signal. Can turn off receiving each different sensor data individually to save battery life. 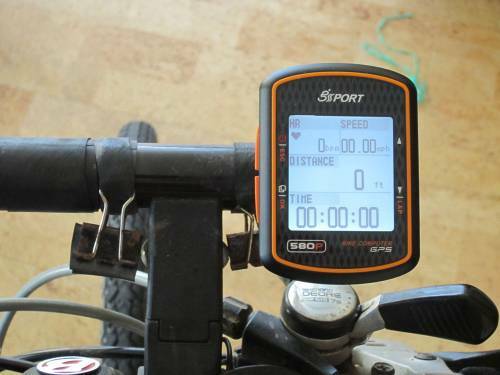 If Speed Sensor is off the speed is calculated using the GPS. The GPS signal itself can also be turned off. Can upload a .KML (Google Earth format) file to the unit and then use the trackback function to follow the route backwards or forward. I have used this function many times, on and off road, and works very well. The unit will display a thick grey line with upcoming turns (see screenshot) that is very easy to follow. No map to follow just a line with turns but it works extremely well. Of course this feature works best with accurate GPS tracks. I have used files from online mapping sites like ridewithgps.com and also tracks created by my own GS-580P and other brands of GPS units. Settings for 5 different bikes. Manufacturer and its team of developers actually listen and consider improvements suggested by owners/users. Can change many settings (but not all) using the included PC software (TrainingGym Pro). Can do a backup of the unit settings to upload latter. Great GPS accuracy and acquires satellite signal relatively fast, about 10-30 seconds on a clear day. At least at my place. Have not had the chance to use it starting at a different location. 4 customizable screens. Each screen can display anywhere from 2, up to 6 fields. A whole lot of data are available. Just to name a few: Distance, Speed, HR, Cadence, Elapsed Time, Slope, Altitude, Temperature, Pressure, Calories, Power, Lap, Pacer (Training partner) and great number of Averages, Max and so on for them (i.e., Average Speed, Max Power, HR in Zone, etc) See table below for listing off all available data for the custom pages fields. Backlight for ease reading riding. The Timex Cycle Trainer seems to be the exact same unit (at least on the outside) Accessories should be easy to find. Easy to use during the ride. Claim 18 hr battery life. I have not tested this yet. Charges using a USB cable. The specs list a Voltage of "3.7V for a rechargeable battery" and "5V for charging input" so if I am correct my crapy tiny iPhone wall chager (5V) would work just fine. I wonder if relying on finding a wall electrical outlet (120 0r 220 W) or USB computer port to charge it would be a workable solution during long brevets, probably not but definitely would work on many bicycle touring situations. 100 Waypoints. This may seem low but I'll need to experiment to see how far 100 waypoints can take me. Built in Barometer for accurate elevation data. Can be turned off to rely on the GPS elevation info if wanted/needed. There is definitely diference between the elevation reported by a GPS signal and a barometer. When I rode to hills that have accurate known elevation on a map the GS-580P, using it barometer, agreed closely with the map. 52416 tracking points. The more often you record points the faster you'll fill up its memory. I set it to record every 3 seconds and it reports I would provide 40 hrs of data records (assuming you have enough battery life) You can set the unit to stop recording when you stop or when you reach a given speed or simply record as long as you decide to start recording. The overall construction for the device and accesories is a par with any Garmin or Timex device. The included printed manual is bare bones. A more comprehensive user manual in PDF format is included in the CD. However like I noted before the Timex Cycle Trainer manual is better written and all info applies to the GS-580P. The product developers are working on a solution for Mac and Linux users and it seems in the short term accessing the 580P as a mass storage USB device, just like a thumb drive, will be available. At least this way we would be able to download files. However as off today, July 5th 2012, that is just a promise but the manufacturer's developing team has a good track record of implementing the most popular users requests. Timex software for the Cycle Trainer does not recognize the GS-580P. It seems the Timex CycleTrainer and the GS-580P units have different firmware and require different drivers. Again as I noted earlier I wonder if the GS-580P can be flashed with the Timex Cycle trainer firmware, then the Timex software, available for Mac, would recognize it? Some minor firmware annoyances Like selecting Imperial units (Miles/Ft) for distance/elevation and the temperature being displayed in Celsious instead of Fahrenheit. Only 1 bike mount is included. it attaches to the stem or handlebars with zip ties which is fine if you never need to move the mount between two or more bikes but with a single bike mount in the package a more user friendly way of securing the mount would have been nice. More Photos: GS-580P with backlight off, Speed Sensor, Cadence Sensor. Adjust display contrast: Turn the device on by pressing Power/ESC and Down arrow/LAP buttons simultaneously. Firmware upload failed and device won't respond? Press Power/ESC, OK and Up arrow simultaneously and for a few seconds. Then try again to upgrade the firmware. Hello friends, how to set up my GS-580P display power output in watts. Creo que todo depende del cubrimiento y la fuerza de la señal del satelite. Yo no he tenido problemas perdiendo la señal. En dias nublados puede ser mas dificil mantener una señal si estas debajo de muchos arboles o al fondo de un cañon entre dos montañas altas. Realmente cualquier GPS tendra el mismo problema. Yo creo que eso puede suceder en muy raras ocaciones. No se a que te refieres con "es el zoom máximo al que puede trabajar" Este GPS se puede calibrar para que obtenga posicion cada segundo o a cualquier otro intervalo. Yo calibre el mio para que obtenga pocicion cada 3 segundos y las rutas aparecen perfectas en mi computador. Pero si subes rutas del computador a websites como strava.com los resultads varian por que cada website usa algoritmos diferentes para reducir el tamaño del archivo y al eliminar el numero de posiciones pues las rutas pierden fidelidad. Aqui hay un ejemplo de una de mis rutas despues de subirla a ridewithgps.com http://ridewithgps.com/trips/1395068 como veras tiene buena resolucion pero si hubiera subido la misma ruta a otro website el resultado probablemente hubiera sido diferente. Hola, estoy interesado en comprar este modelo de gps, sobre todo por su función de seguir una ruta por la montaña. Me gustaría saber si lo hace sin perderla y cual es el zoom máximo al que puede trabajar, gracias. Nada...que ya lo tengo todo funcionando y a topeee!! he instalado el st3 con sus plugins. Y ya puedo exportar los tcx a strava...perfecto! Espero no abusar de tu amabilidad...jeje. Tengo algunas dudas más, que paso a exponerte, a ver si puedes ayudarme. 1.- Veo que indicas que tu unidad ofrece la temperatura. Yo no he encontrado la forma de visualizar ese dato. ¿es posible que el mio no lo tenga? 2.- En mi anterior receptor GPS (Bryton Rider) se quedaba grabada la cantidad de kilómetros totales acumulados, de forma que en cualquier momento puedes ver cuantos km has hecho desde que empezaste a usar el receptor. ¿hay alguna forma de que el 580p haga lo mismo? 3.- Hay alguna forma de que la hora y el día se queden grabados? lo digo porque parece ser que cuando no tiene cobertura por satélites, no es capaz de actualizar la hora y la fecha. ¿te pasa a tí lo mismo? de momento ya está todo. Cuando reciba el sensor de cadencia y de frecuencia cardiaca, me explicarás como subir los datos a strava. Veo que hay que hacer algo con sporttracker y también instalar un par de plugins. Hola, amigo...se nota que controlas este aparatito...que bueno!! funciona de lujo!! Si vuelvo a tener algún problemilla, te lo hago saber. 4)Selecciona la ruta que deseas de la lista. Ahi estan las rutas que el GPS had grabado y tu no has borrado del dispositivo y tambien las rutas que tu cargaste por medio de TGP en el paso 1. Dependiendo de la distancia de la ruta, este ultimo paso se demora desde solo usos segundos hasta 15-25 minutos o mas. Si la ruta que quieres navegar es una que gravaste en el pasado con el GPS el proceso es mucho mas rapido. Ya he recibido el 580p, ayer mismo, y en principio va perfecto...salí a dar una vuelta con la bike y detectó en pocos minutos los satélites. En casa, instalé el training gym que venía en un cd y actualicé el firmware a la versión 2.0. Luego volqué el entrenamiento que acababa de hacer y pude observar la cantidad increible de parámetros para analizar. Todo genial...pero cuando intenté cargar una ruta en GPX en el 580p, fue imposible. Me decía "ruta cargada con éxito" pero cuando voy al menu "rutas" no hay nada dentro. También he intentado en formato KML, y me dice el training gym, "formato no reconocido" ¿qué estoy haciendo mal? Muchisimas gracias por tu inestimable ayuda!! Hola Juan, La respuesta corta Si. No he añadido esa parte a my review pero puedes subir (upload) al GPS rutas en formato KML y despues navegar la ruta hacia adelante o en reverso. La pantalla te da una linea que es muy facil de seguir. Yo he usado este GPS en rutas de montaña que no conosco. Ademas creo que tiene alarmas para indicar que estas alejado de la ruta pero yo no uso las alarmas. Yo voy a actualizar my review con una imagen de la funcion de trackback y una descripcion de como funciona. hola, he visto que tienes este receptor de GPS y me pregunto si, además de grabar la ruta para volcarla al PC, también puede guiarte en rutas de montaña mediante algún tipo de indicador de sonido o de imagen. Hola, estoy esperando que me llegue, lo compre en dx hace 10 días. re: Where did you buy your GB-580P? dx.com. As with everything I have ordered from dx.com it takes a while to get to the US (about 3-4 weeks but have not found a place that beats their prices. They also have decent customer service in case you have issues with your order. Good luck! I really like my GS-580P. Where did you buy your GB-580P? Could you let me know where you bought your Gps from? I'm considering getting it from dx.com but I want to be sure the dx one is authentic.